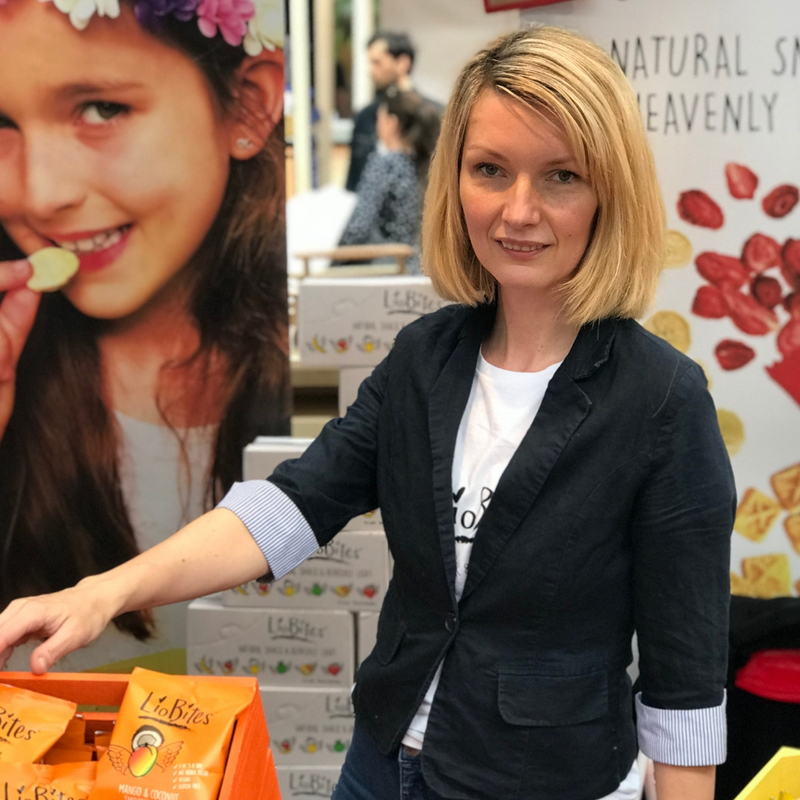 This week on my parents in business series I’m delighted to be featuring Anna who created the LioBites brand selling freeze-dried fruit in handy snack packs. This is a brilliant idea for parents whose children love to snack all day (like mine) and you’ll be reassured that they are eating healthily. Here Anna shares her incredibly successful business story with us, and in the space of one year she has done amazingly well. Her top tips for setting up your own business are extremely honest, and if you’re thinking about doing the same I would advise you to read on…. Tell me a little bit about you, your background and LioBites? As a mum of 2 school age children, I was tired of working in London and struggling to be a good mum and a good employee at the same time. I wanted a work-life balance and to be more creative with feeling of the satisfaction and fulfilment. The idea of LioBites was inspired by my youngest daughter Livia. She would always pick out all the freeze-dried berries from of my breakfast cereal so I thought how great it would be to have healthy freeze-dried fruit in a snack size pack. I launched LioBites in March 2018 after 1 year of product development. Running a start-up business and being a parent at the same time requires a lot of motivation, organisational skills and self-discipline. My office is based at home and this in itself can be disruptive. I had to learn to switch off the urge to tidy up the kitchen during the working hours, set myself tasks, write things down and focus. I answer emails all the time including the evenings and weekends, set up meetings in between school runs and on the last holidays, I even took my laptop to do a conference call from the hotel room. My kids are school age, so I try to get most work done between 9am-3pm. I have my phone on me while taking them to after school activities and often utilise this time to answer my emails. I also try to get the girls involved, helping at trade fairs, setting up photoshoots and modelling for promotional shoots- we are a typical family business! My husband is very hands on too, you need your partner’s support, especially during the working weekends and overnight business trips. He also helps during the weekends, attending selling events from time to time on top of his full-time job. Multitasking can be great and useful, but it can also be draining. I found myself being overworked by the constant alertness and started to become forgetful. Since launching LioBites in March 2018 I have been working 7 days a week, running the operations during the week and selling, promoting the brand during the weekends. We are still in a start-up stage, but we are about to do a pilot stage rollout with kids Holiday Camp activities provider; Super Camps. We have also signed up with major online retailer and have had a lot of interest from the travel industry. In addition to this we are also exporting to Germany and are featured in the healthy subscription box Foodist. As a part of our market research, we did 2 Degusta box campaigns inserts. Our LioBites Smoothie Bites Mango & Coconut & Mango, Banana & Passion Fruit were rated 15% above any other fruit snack featured in terms of the flavour and customer satisfaction. My tip for working parents is writing things down. We have a family calendar on the wall in the kitchen, where all the weekly activates and events for the whole family are written down. I also use Google calendar and alerts on my phone and a large diary to write down daily tasks. I’ve made friendships with other small business owners, that I met at networking and sales events. We all share similar character traits and we all face similar challenges. It is important to connect with like-minded people, as friends who have full time jobs can never fully understand your everyday challenges. There are start-up support organisations worth joining: Enterprise nation, Virgin Start-up and Young Foodies. As a member you meet like minded people and benefit from professional advice and business connections. Social media is great for groups in your field too – I am a member of the Food hub and we all share tips, ideas and contacts. My final advice for any parents looking to launch a new business is – Be brave and go for it! Kids change your perception on life. No longer it is just work and leisure, you have become a role model for a young person, and they look up to you. If you can spend more time with your kids and achieve work satisfaction, surely it is worth taking the risk. But make sure you have a plan B and set yourself time limits to mark your progress and achievements. When I have a bad, stressful day I am thankful for all the good and positive things in my life. I always try to look ahead and remind myself that even if it all fails, I still managed to inspire my daughters to work and to be brave. They are proud of me and LioBites and this in itself is a great achievement – hopefully I can leave the legacy for the future generations and all the hard work will pay off. You can find out more about LioBites on their website, or their Facebook, Twitter and Instagram channels.